After 35 years in the industry, Cee Vee Vending still provides the core service that started it all – traditional vending. 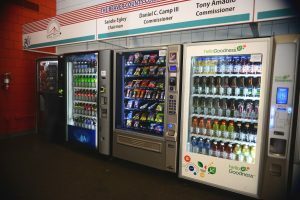 However, the technology of vending is anything but traditional as equipment is more advanced than ever, providing a wider variety of products coupled with greater convenience and reliability. We supply the equipment, stock the machines, and provide 24-hour service to our customers, making us the best choice for food vendors in Pittsburgh, PA. This state of the art equipment will vend bean-ground coffee, whipped hot chocolate, decaffeinated coffee, cappuccino, and other flavored products. Products can be dispensed in two different cup sizes, or into your reusable mug. This equipment will be stocked with selections of our commissary-prepared breakfast items, sandwiches, dinner platters, salads, desserts, and fruits. All healthy choice and low-fat items will be clearly marked with our “Wise Choice” labels. All “Wise Choice” items have nutritional content marked on each label. The appropriate condiments and cutlery are provided for each item served. 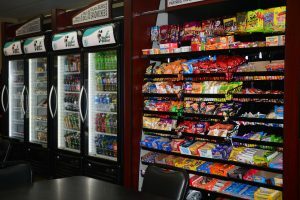 Our vendor in Pittsburgh, PA, only uses nationally advertised products in your snack vending machines. Each machine will be kept stocked with fresh pastry, candy, and potato chips, as well as no-fat and low-fat alternatives. All healthy choice items will be clearly marked and easily visible. This equipment is capable of dispensing up to 32 selections of 16 oz. and 20 oz. cold drink products, including soda, specialty sports drinks, flavored and vitamin waters, bottled teas, juices, and specialty drinks such as Red Bull and Gatorade. The robotic arm delivers the product to a convenient location for pick up. Contact us for a no-obligation evaluation of your vending potential. Based in Darlington, Pennsylvania, we proudly offer our vending services in Pittsburgh, PA, and throughout the tri-state area.